Our unique scheduling and training delivery app developed in-house. We’re always looking at ways to make RiskTraker® even more useful for all users. This is why we developed our RiskTraker® App for Trainers which replicates key functionality of the desktop version into a feature-packed app offering total management of all training scheduling, booking, invoicing and reporting. Available for Apple and Android, the RiskTraker® App assigns training sessions on the basis of the location, availability and skill set of the trainer, ensuring a consistently high level of quality and convenience for both delegates and trainers. The App confirms and schedules bookings, offering a complete overview within which trainers can add holidays or other times they are not available. The RiskTraker® App also makes it easy for trainers to produce Post-Training Reports – these are integrated into the app, helping to ensure consistency and delivery within 24 hours of completion. 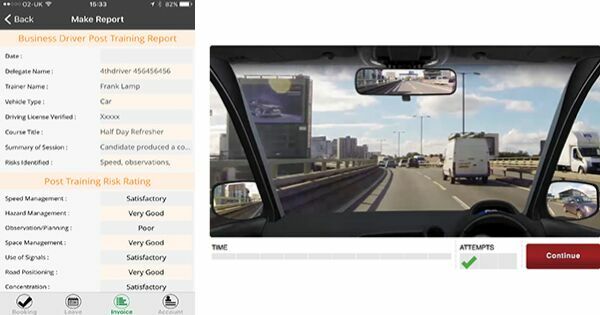 Furthermore, the app’s video and audio capture capabilities mean that trainers can record sequences of videos and commentaries that help underline key issues raised within the session – this is unique to Business Driver and provides an unmatched level of personal instruction and feedback. The App also ensures that sessions are signed-off by trainer and delegate, contributing to an audit trail within RiskTraker® that allows Fleet and HR Managers to gain a birds-eye view of all training undertaken and evidence of legal compliance.